Wow, this is incredible. 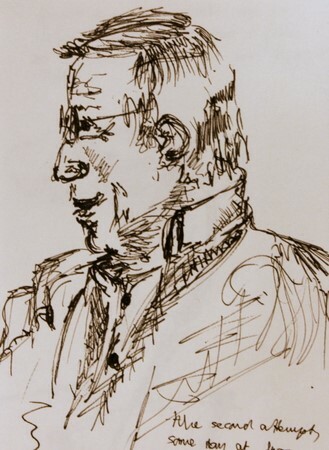 Did you draw from life or a photograph? I really love it. 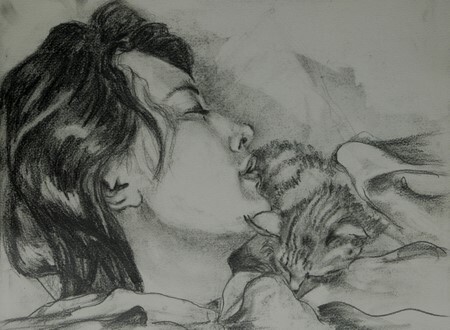 Hi Casey, this was done a while ago, when Tokala was still a kitten, maybe a little over a year ago? They were asleep on the couch and I had ample time to indulge. I dug it up yesterday when the “Crash” assignment came up and did rework it a bit..making the values more distinct/darker, using 9B Monolith. Thanks for your nice comment! This is beautiful Ronell.I just noticed you linked me..thank you so much. We went to Andorra for a week of snow and ski recently. No skiing though, since there wasn’t any snow except for that made by snow canons. The girls did ski, but H(love of my life) and I passed on that one, so we did a lot of other sightseeing. One thing we did frequently, was going to the sportcentre where H could make use of WiFi available. It may sound like he is a workaholic, but he is as passionate about what he does in life as I am about doing my art. He loves his job, so his computer and notebook and pen and paper go with him, like my stuff travels with me. 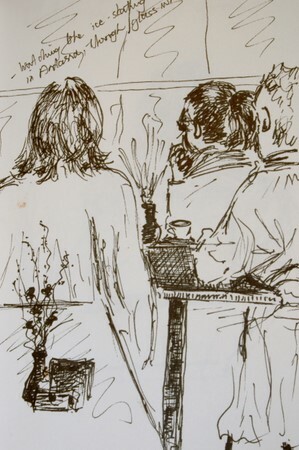 So, while he “WiFis and calculates and designs, I draw and write and read and watch the world go by and of course, we enjoy a cuppachino or two. The spoet centre was a great place – a big complex with indoor pools, ice skating rink, tennis courts…and a cafeteria. 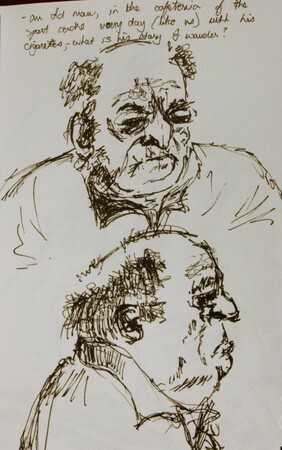 I did these drawings while having our coffee. 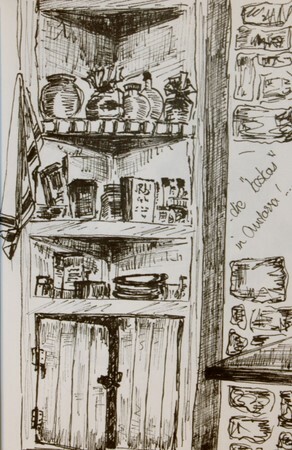 The first sketch is the “food corner” in the house we stayed in. hey, these sketches are great. what a great window onto your vacation! Much more fun than photos. Nice, Ronell. These are really great – and I especially love the top one! I don’t have any fond memories of scissors, in fact, I pretty much associate them with pain and blood, of which I have first hand experience. But then again, if I think of life without them, I can quickly conjure up images of pleasure. Like everybody else, we have scissors everywhere throughout the house. In the bedroom a small pair for removing labels or a loose thread here and there. In the bathroom…well, you know what scissors are used for in there..Then there is the handyman that cuts just about anything, although I don’t believe in this all-round-scissors. I want one for every purpose – one for cutting hair and one for cutting paper, another for cutting plastic and one at close hand when I can’t find the hammer, or the screwdriver or the can-opener…The sewing kit has a few of its own, and to my dismay, the huge fabric scissors is in high demand at Christmas when all the others scissors have magically disappeared. The kitchen is an interesting topic. I have yet to figure out the system – one for every task? But that would leave neither time nor place for anything else in the kitchen. I had a pretty little old one from my mother which I kept in my handbag and forgot to take out before we had to board. I still have another one left, a very ancient model, frequently used by her and even though it lacks performance, its beauty stays unsurpassed. No psychedelic colored plastic in sight and the handle shows signs of hard use and yes, the blade is full of rust spots, but the lines are sleek and graceful and the grip allows for good comfort. 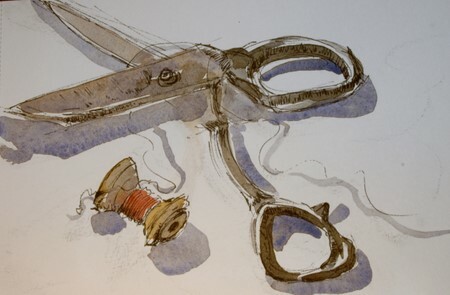 Just a simple, beautiful, old pair of scissors from my childhood, one that comes from my mother’s sewing kit and is now not so much a utility as a connexion to the past. So maybe I do have fond memories after all…. Welcome to EDM Ronell. I really love your scissors. They are beautiful. You are a wonderful artist. Greetings from Germany. Ohhh these are Very Nice – Very Nice, Welcome and you will have a blast here and learn sooooooo much. Thank you, Nik and Sandy, for the warm welcome and for the kind words – I feel like a child at Christmas; the one super gift after the other!! Bonjour Ronell…and welcome to EDM …i think you are definitely going to be a great contributor with your wonderful sketches…ils sont tres magnifique! Hi Ronell, welcome to EDM! 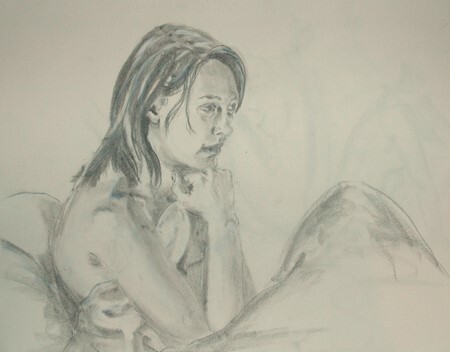 Drawing with graphite on paper. A fair exchange – an hour or so for a new jean. This is gorgeous! I love your blog, glad to see it up and running. I am so new to this blog-thing, so If I mess up or take more space than I ought to, or invade or whatever the case, I apologize…to be honest, I have saved this post almost 15 times as a draft, before I finally published it! This is really lovely Ronell – a departure from your usual style! 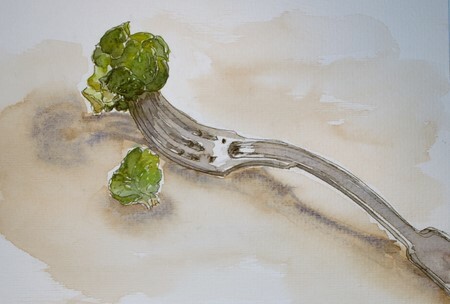 It has a stylized quality that would look great as a cookbook illustration. Welcome to EDM! What a fabulous blog you’ve got here!! 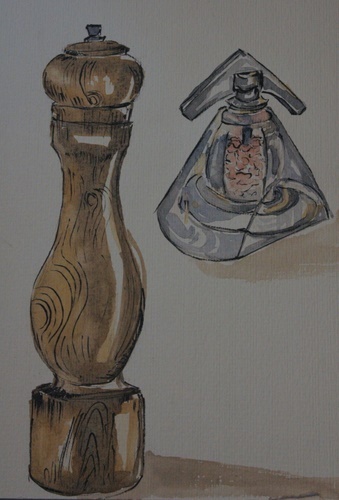 Your artwork is very lovely; I love the look of wood texture you have captured on the pepper mill. I agree with Casey, this would make a lovely illustration in a cookbook. Great start for blogging. The scissor painting is gorgeous!